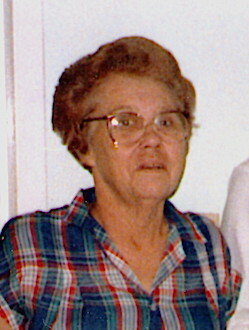 She was the matriarch of a very large, respected Cumberland County, KY family. Mrs. Ava Ruth Thomas Appleby, age 90, of Burkesville, KY, passed away on Tuesday, March 20, 2018 in Berea, KY.
Funeral Service for Mrs. Ava Ruth Thomas Appleby will be held at 2pmCT Sunday, March 25, 2018 in The Memory Chapel of Norris-New Funeral Home, 601 N Main Street, Burkesville, KY. Burial will be in The Burkesville Cemetery. The family will receive friends after 3pmCT, on Saturday, March 24, 2018 until the funeral hour on Sunday. Norris-New Funeral Home, 601 N Main Street, Burkesville, KY, is in charge of arrangements. 2018-03-23 - 601 N Main Street, Burkesville, KY - Photo from Norris-New Funeral Home.